Busch Stadium, home of two NFL teams during its existence, also served as the home of the St. Louis Cardinals (MLB). During the 1950's talk began about the possibility of building a circular multipurpose stadium in downtown St. Louis. For more than five decades, the Cardinals had been playing at Sportsmans Park. In 1960, the Chicago Cardinals moved to St. Louis giving the city a professional football team. Both football and baseball teams shared the same name, St. Louis Cardinals, and shared the same facility Sportsmans Park. By the early 1960�s Anheuser-Busch pledged $5 million, and the city pledged $20 million toward a new stadium. On May 24, 1964 ground was broken for a stadium on 30 acres in downtown St. Louis. A concrete, circular, multipurpose stadium was built in just under two years. The St. Louis Cardinals (NFL) played their first game at Busch Stadium on September 11, 1966. Three tiers of 50,000 red circled the grass gridiron. In order for the stadium to be converted from a baseball field to football, two sets of 8,000 seats could be moved parallel to each other to form the football gridiron. Astroturf replaced natural grass in 1973, so the stadium could be converted from football to baseball more easily. With dwindling attendance and two consecutive losing seasons, the owner of the Cardinals, decided to move the team west to Phoenix, AZ after the 1987 season. The St. Louis Cardinals beat the New York Giants 27-24 before 29,623 fans in their final game at Busch Stadium in the late afternoon on December 13, 1987. The St. Louis Cardinals (MLB), were the only tenant of the stadium until 1995, when the Los Angeles Rams moved to St. Louis. 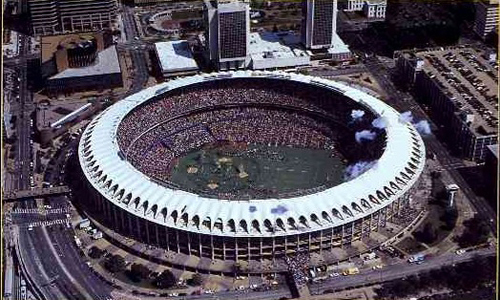 The Rams played part of the 1995 season at Busch Stadium, and then moved into their own stadium, the Edward Jones Dome. The last NFL game at Busch Stadium was on October 22, 1995 when the San Francisco Forty-Niners defeated the St. Louis Rams 44-10 in front of a sellout crowd and a national television audience. 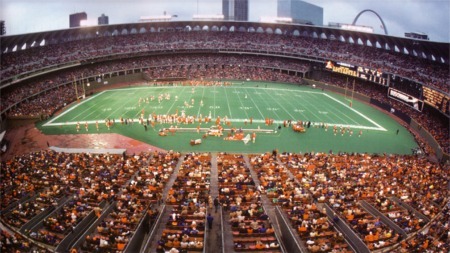 After the Rams moved out of Busch Stadium, it was retrofitted for baseball only. Grass replaced the Astroturf, and numerous other features were done to Busch Stadium.